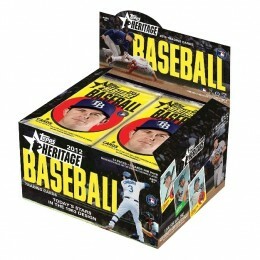 2012 Topps Heritage Baseball, one of the biggest sets of the year, is just around the corner. The release always excites many collectors and case breakers. Topps Heritage is able to reach a new generation of baseball card collectors while still having something for those who remember buying or collecting the cards from an earlier era. Recently, when browsing 2012 Topps Series 1 auctions on eBay, I came across listings for 2012 Topps Heritage sets being sold six to eight weeks before release. I was surprised to say the least as I have not seen sets sold this far in advance before. It led me to tweeting many random thoughts about Topps Heritage and set pre-sells (not cases or boxes) in general. This guide is intended to be used in conjunction with some general guidelines I wrote about that can be applied to any release. Topps Heritage Baseball is a wonderful product and it does well at holding its value. It has also taught case breakers and pre-sellers valuable lessons in the past. Here are some of the things that I have learned. I recall back in 2007 I had pre-sold some master sets and then once the release was live, there were Yellow Letter Variations every sixth pack. I had all my buyers saying they paid a premium for the master sets early and wanted those to be included. That led to me putting wording in my auctions saying, "no SP or Variations included" or at least, "no special or unannounced SP included, only the traditional base set SP included." Also, I cannot tell you how many sets I had to mail out fast because of pre-sells only for an SSP to be found a week or two later in a player's name or in the stats on the card back or position, etc. That can be more costly than selling a few base sets for a little less. Not to mention less fun. 2008 Topps Heritage Baseball was a mess. Those who did not pre-sell laughed at those of us who did. Heritage had an unannounced black back set of 110 cards. They were a great addition, until you started sorting the base set out. Those same 110 cards were not found as easy in the base set. Basically Topps printed half of the 110 cards with black backs at 1:2 packs and the other half on the regular set green backs. It drove me crazy. I began selling short sets of 315 cards without those 110 green backs as they were more scarce than regular base cards but not as scarce as regular short prints. I also started listing those 110 green backs as semi-short prints. I can't believe that stuck, but it did. I shared my thoughts with other breakers and we all agreed to sell sets as 315 cards, 425 cards, or the master set. Beckett even listed the 110 cards as semi-SP. It drove values up on the base 425-card set to double and even triple what they had pre-sold for and added value to the master set by having the green and black backs. In 2009, most breakers had base set collation issues. I had 100 of some base cards and 20 of others. It was like sheets of cards were not mixed correctly. The good thing was that others had extras of ones I needed and I had ones they needed, but it was a nightmare to trade and find the right people as it never seemed to match perfectly. I still ended up being short many sets and had to refund and sell large lots of leftover cards. Heritage is a strong seller, but with more listings comes falling prices. At times, the decline is severe. Sometimes sellers panic because an item has not sold or had a bid in 24 hours. Most don't see a lot of action these days until the last few seconds anyhow. This causes prices to be lowered and undercutting to start. It could just be that because the set is not yet live and there are fewer people looking for it at that moment. I always say adjust to the market. Don't panic, but don't over-price either. Try to base prices from completed items and past years' experience. Wait until demand is highest and closer to the live date to find what the true market is. I have no problem with a seller offering something for whatever price they want. That is their right. I have known buyers to list dummy auctions at lower prices just to get sellers to lower their prices. I am sure it is rare, but I have seen it. The same can be said of sellers that list dummy auctions high only to try and set the market higher. I believe honesty is best and to let the market do what it does. Of course if you have a more rare item, that is different and you may want a specific price for it. But with sets, you have multiples of them. Sometimes you have to move it at what the market is, but the market is lower than expected due to slow pre-sells. Often sellers create a softer market by over-listing and driving prices down, even on hotter sets or items. Last year, base sets sold very strong during pre-sells between, going for $40-$50 plus shipping. They picked up steam at release with some going up to $50-$60. Master sets usually start out bringing $380-$420 for the typical 500-card set plus the 4 basic insert sets (545 total cards), then usually drop to the $350 range right before release. At release week, they typically settle around $300-$330. Still these are good prices for both the buyer and the seller. Not too many collectors want to shell out that much money and wait weeks to get their set. I sell many Heritage sets direct to buyers too. This is where you do have to be fair on and off eBay. You may run into those that paid a higher amount, then two weeks later even though the product has still not released you are listing for cheaper. That can cause you to lose future business, receive poor feedback and even buyers requesting refunds. If you are honest and have a good relationship with the buyer this usually is not a problem.